Dubai, United Arab Emirates, 26th March 2019: With properties worth USD 30 billion on display, Sheikh Mohammed bin Khalifa Al Maktoum, the Chairman of Dubai Land Department (DLD) inaugurated Dubai Property Festival (DPF) on 26th March 2019 at Dubai World Trade Centre. The inauguration also witnessed the presence of HE Sultan Butti bin Mijrin, Director General, DLD, Majida Ali Rashid, CEO of DLD’s Real Estate Investment Management and Promotion Sector, HE Mohamed ben Saud Al Ghezwani, Undersecretary of the Ministry of Housing of Real Estate Development and General Supervisor of the Waﬁ program, KSA and HE Fatna Lkhiyel, Secretary of State for Housing Ministry of National Planning Urban Planning, Housing and Urban Policy, Morocco. 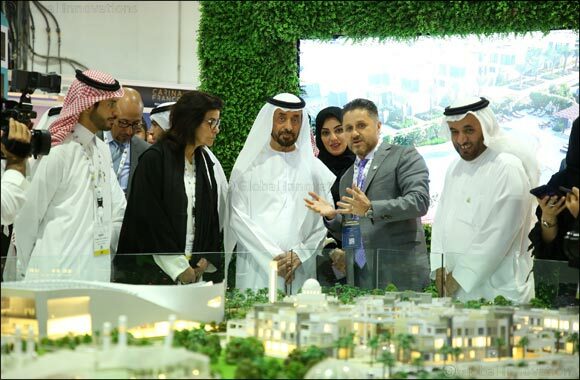 While touring the show, HH Sheikh Mohammed bin Khalifa Al Maktoum visited several exhibitors including Azizi Developments, Dubai Sports City, Dubai Police, Danube and Ministry of Housing in Saudi Arabia among others. “At this edition, investors will have an opportunity to experience a high-quality life, surrounded with enhanced technological developments, that demonstrates the prestige of the real estate projects in the country. While high end services and integrated infrastructure are synonymous with Dubai’s real estate ecosystem, innovation, creativity and luxury have positioned the country as a top destination for real estate investments in the world,” he added. DPF 2019 takes places in partnership with the International Property Show (IPS) and runs until the 28th March. With competitive bank interest rates starting from 1.85 p.a. and no processing fees on home ﬁnancing, the show is a strategic platform for end-users, investors and developers to sell their project offerings onsite at much lower prices. The first day of the show started with a session on the global real estate markets and two separate plenary sessions titled ‘Real Estate Investment Climate in Dubai Market Overview: Opportunities and Challenges for the Nearest Time’ and 'Influence of the Financial Institutions Cooperation to the Real Estate Investment Environment for International Investors.' In addition, training courses were conducted by Dubai Real Estate Institute (DREI) on the inaugural day. “DPF is going to be the biggest gathering of top real estate developers, investors, government authorities, banks and other financial institutions, legal service providers, home buyers, and all professionals involved in the design and construction of residential and commercial real estate developments. We are confident that this year’s edition will be critical to Dubai and the UAE’s flourishing property markets as it will help bring in new leads and business deals to local property developers. It is our hope that we exceed the success of last year’s DPF during which a total of USD 1 billion in revenues were generated,” said Majida Ali Rashid, CEO of DLD’s Real Estate Investment Management and Promotion Sector. DPF this year will witness the presence of several developers, property owners and institutional bodies from over 12 countries. Some of the major players on display will be PMD Real Estate Network from Greece, KM First Class Homes from Cyprus, Desjardins from Canda, Prestige Expo from Spain, Cote D’Azur from Portugal, The Economic Development Board of Mauritus, Oral Mimarlik Gayrimenkul from Turkey, Pine Gardens Murree from Paksitan, Ltd Rekan from Georgia, The Eleet Land Specialist from Australia, Robinsons Land Corporation from Philippines and several others.